Expires soon. Enter code at checkout DV10010. desiVastra.com (NY, USA ) Fulfilled by DesiClik.com. When you see DesiClik fulfilled badge, products are guaranteed for replacement in case of defects and they are shipped by desiClik.com. Beautiful georgette green and pink churidar kurta for kids. The green kurta is entirely covered with green sequin stripes and beautified with pink sequin flowers. The kurta has an inner lining for comfort. 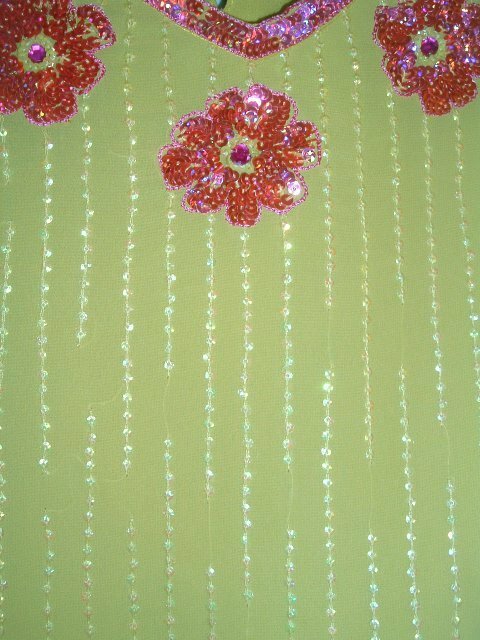 The churidar is covered with pink sequin stripes at the bottom and embellished with green sequin flowers. The churidar has drawstring waistband. The matching dupatta is plain pink. Sizes available for girls 6 years old and up. Domestic (within USA): We use USPS for all your shipping needs. You can choose between Express (next day delivery - starting @ $17.00) or Priority (2-3 days - starting @ $6.00) at the time of check-out. All orders will be processed within 2 to 3 business days. You can expect to receive you order within 7 business days depending on the shipping method you choose. All merchandise is shipped from our warehouse in New York, USA. Clothing with sequins, bead or any kind of work should be dry cleaned. Cotton clothes may be hand washed or machine washed separately. Please email us based on the email address on your invoice for a Return Approval within 24 hours of receipt of shipment. Pack the merchandise as you received it with all packaging and tags intact, and ship it back to us within 3 days of receipt. For your security, please return the package to us by an insured courier (FedEx, UPS or Parcel Post) and retain your receipt. This will protect you in case your return is lost in transit. All returns should be sent to the address as specified in the packaging slip. A 10% restocking fee plus S&H will be charged for all returns and exchanges after 3 days. Once your return is received, it will be reviewed by our Returns department. You will receive an e-mail notification regarding your return or exchange within seven business days. Any unauthorized, uninsured, improperly packed package or any package not postmarked within 3 days of receipt will be returned to sender. Items that show signs of wear or have been used, altered, or damaged in any way cannot be accepted for return. Your money will be refunded or your credit card account will be credited for any payments you have made toward your purchase. Refunds on purchases made with a credit card will only be credited to the same card. Shipping charges, low order fees and any other initiation charges, if applicable, are not refunded; if merchandise was shipped free, upon return / exchange, the initial shipping cost will also be charged to the customer. Please allow one monthly billing cycle in order for your credit to appear. 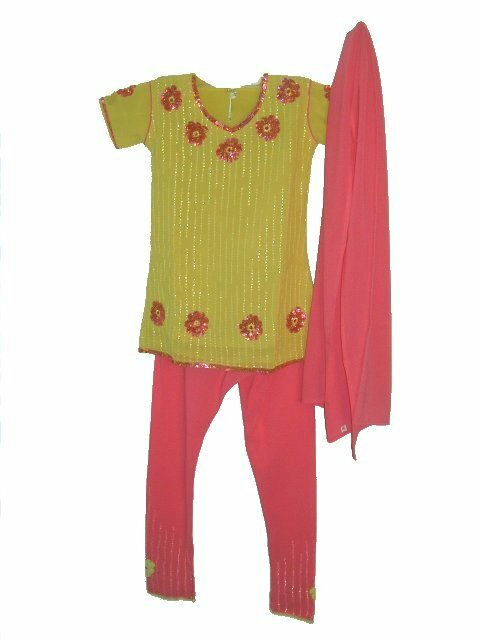 This item in Salwar Kameez for Kids category was first added to our catalog on 07-03-2010. Buy Churidar Kurta For Kids In Green & Pink W/ Sequin Work, sold & shipped by desiVastra.com where you can shop online for Traditional Dress for Baby Boy & Girl, Indian ethnic Wear for Kids. This Salwar Kameez collection has been tagged as salwar kurta, churidar kurta, readymade, kids wear, punjabi, indian clothes. Note: There may be a slight variation in shades seen on the screen. Thank you very much for everything. All the stuff came in at the right time. Happy Diwali & A very Prosperous New Year to you & Family.